UNITED NATIONS, May 24 -- One week after refusing to provide the name of the fifth of the "five South Koreans" that Ban Ki-moon brought with him into the UN Secretariat, because "he is in the UN Department of Management," on Wednesday night the name was provided: Kweon Ki-hwan. Inner City Press: Yesterday I was informed by your office that the Secretary-General had placed a man called Kweon Ki-hwan in the Department of Management, so I just have a question I'd like to know. What was the post? What post is he in and what was the process for placing him in the post? Do you have that? Deputy Spokesperson: I thought I had something specific for you on that. I think, I may be going beyond my mandate here, but I think in terms of answering questions on the rank-and-file of staff members who are not senior appointees, I'd rather give you the answer to these questions out of the briefing. But even outside of the briefing, in the ten hours afterwards, this basis information was not provided. Various UN staff have opined to Inner City Press that while the Secretary General may be free to do as he pleases with several posts in his 38th floor office, posts in other UN Departments, including or especially in Management, are not to be handed out, but are subject to recruitment, interviews, competition and selection. These people note that there may be a loophole, such as that Kweon Ki-hwan may be listed as a consultant -- another question not answered -- or may technically be posted in the Executive Office, although physically in the Department of Management. Staff there have said they are not sure what Kweon Ki-hwan's post or job is. "Mandate review," one staff afraid of retaliation said with a scoff. Or Kweon Ki-hwan may be on "secondment" from the South Korean mission to the UN, where he was a First Secretary, as reflected by the UN's October 2005 publication, "Permanent Missions to the UN." That is a public document, showing names, ranks, and nationality. Ironically, the UN's publication with precisely that information, "List of Staff of the UN Secretariat," is still being withheld. 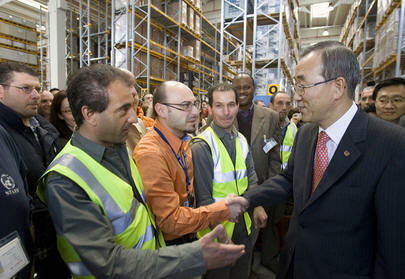 Mr. Ban and UN staff: a secret handshake? Alicia Barcena wanted the Spokesman's Office to get back to you on a question you had for them on the list of staff. The document contains extensive information on every staff member listed, including name, nationality, grade level and location. Such information is deliberately not provided in official documents made available to the public at large. The provision of that information to Governments is carried out by the Secretary-General to fulfill his obligation under the above Section 17. To make such information available to the general public would not only affect the privacy of the individual staff members, but could also be detrimental to staff for security reasons, especially to staff serving in hazardous duty stations. Furthermore, if the proposed "Access to Information policy" is eventually introduced, it would not apply to any information that could endanger an individual's security or violate his/her privacy. While the response is appreciated, it must be noted that the UN publication "Permanent Mission to the United Nations," which is freely distributed, contains names, nationalities, ranks and even the names of people's spouses. So currently the Secretariat is more secretive about its own staff, the people it hires, than the people employed in the member states' missions to the UN. The argument above is questionable, that providing the names of staff would affect privacy, since these names are already available in the UN's telephone directory. That the List of Staff was created in order to provide the information to Member States does not mean that, once created, it can legitimately be withheld from the press and public. The sine qua non of any credible Access to Information policy is the presumption that records are available, except specific enumerable portions the release of which would cause harm. In this case, such specific enumeration has yet to take place. Troublingly, in light of the claim that the UN is working toward a "gold standard" of Access to Information policy, the statement above does not take into account the procedure in many countries' freedom of information laws, that whole documents cannot be withheld simply because some portions of the contents are confidential. The US Freedom of Information Act, for example, provides that "any reasonably segregable portion of a record shall be provided to any person requesting such record after deletion of the portions which are exempt." The UN could, for example, withhold only those staff "serving in hazardous duty stations." This would presumably not include, for example, Mr. Kweon Ki-hwan. A more formal request, with citation to the Freedom of Information Act and relevant UN resolution has been submitted elsewhere within the UN, and the inconsistencies identified above -- partial withholding, and the treatment of diplomats' information -- should also be considered. Inner City Press has asked: "please confirm that it is not "if" but "when" a UN Access to Information policy is introduced, and that information other than segregable portions which would violate privacy or cause danger, and is not otherwise publicly available, will be released." We will continue on these issues.